In response to Poincaré’s challenge, two more proofs of CBT were produced in 1906, by J. Kőnig and by Felix Bernstein. Both proofs were presented by Poincaré in sessions of the French Academy of Science. J. Kőnig’s paper was published in the proceedings of the academy for July 1906, and that of Bernstein in December 1906. 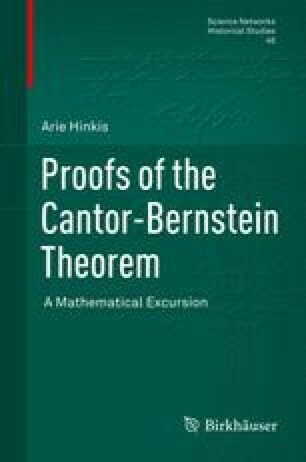 In both papers CBT is called the Equivalence Theorem; J. Kőnig adds “of Mr. Cantor” and Bernstein “of set theory”. It is likely that the authors did not actually present their papers in person and that Poincaré merely presented the papers for publication in the proceedings. In this case the delivery of the papers to Poincaré was surely accompanied by some letter exchange between the authors and Poincaré but we know of none.